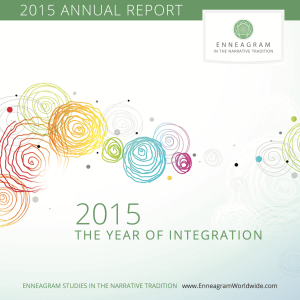 Click on the image to see our 2015 Annual Report. We certified four new Enneagram Narrative Teachers and the first five Enneagram Narrative Professionals, who will use the Enneagram in therapy, counseling, coaching and spiritual direction. The first Enneagram Narrative Weekend through our new Collaboration Initiative sold out in Oklahoma City with 45 participants. We laid the groundwork for our second Enneagram Narrative Learning Community, which launched in Menlo Park in February 2016 with more than 40 participants. Each of these new initiatives required considerable planning and development by faculty and staff before they could be implemented. Consequently, none of them would have been possible without the financial support of the Enneagram Narrative Community. As last year was drawing to a close, I had an email exchange with two people who asked provocative questions about the objectives of our work and the need for a continuous fundraising campaign to support it. I agreed but felt some anxiety that saying so might sound grandiose. Anticipating that response, he said, “Ultimately, it’s vital to life as lived and, dare one say it, the survival of the species.” He’s right, of course. So with his encouragement, I’m daring to say it now: What we do is aimed at nothing less than the survival of the species! Why, then, should it be necessary to do fundraising to accomplish such meaningful work? Here my other correspondent came to the rescue with analogies from her own experience. “This is like the theatre business where selling out shows is good but not enough. Theatre requires support even when it is popular.” She went on to add that “Canadian hospitals are the same – they rely on community fundraisers even though they cannot actually accommodate every donor.” Right again. A significant difference between hospitals and ESNT, however, is that we can, and do, accommodate our donors. Each of us has actually experienced the impact of the Enneagram Narrative teachings in our lives, and those experiences can be relived many times through enrollment in ESNT programs or workshops offered by our Core Faculty and Certified Teachers, or by working with a Certified Professional. To ensure this remains the case, however, the “theatre” must keep its doors open, and that depends on your willingness to help underwrite a portion of our basic operating costs. Tuition and other earned income cover less than 75 percent of our expenses. Developing new programs and expanding our outreach in the world ­– our “R and D,” if you will – depend on your support. Whatever you can contribute is deeply appreciated. And may I ask that you consider making regular monthly contributions in an amount you can afford, through PayPal or credit card deductions? It’s easy to do and helps us keep abreast of expenses that continue all year long. Just go to www.enneagramworldwide.com/donate/ and follow the easy instructions. Thank you! And may you enjoy the blessings of spring, wherever you are!